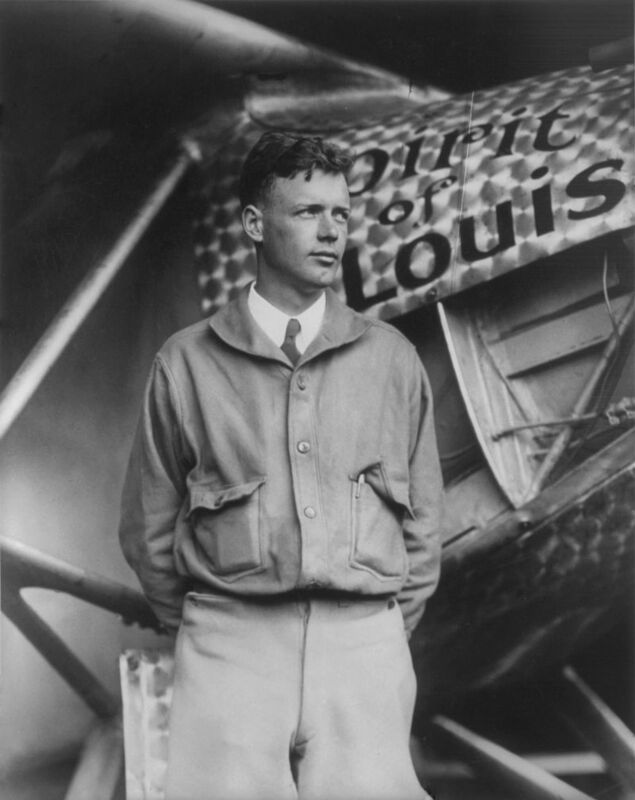 Charles Augustus Lindbergh, the celebrated aviator who made the first solo non-stop trans-Atlantic flight, was born on February 4, 1902 in Detroit, Michigan. He grew up on his family’s farm in Minnesota, where the shy, reserved boy quickly showed an affinity for all things mechanical. Too young to enlist during World War I, Charles was enthralled by the exploits of the fighter pilots serving in Europe. When he discovered he wasn’t really college material after a few semesters, he enrolled in flight school in April 1922. In the air, he was a natural. Lindbergh learned to pilot planes in no time. He set off on barn storming tours across the Midwest, where intrepid aviators would perform dangerous mid-air maneuvers before appreciative crowds. After the show, pilots would take passengers on brief sight-seeing tours to make a little extra cash. Itching to fly more sophisticated machinery, Lindbergh signed up as an air cadet in the U.S. Army. But there wasn’t much need for fighter pilots in peace time, so Charles took a job planning airmail routes for Uncle Sam. Lindbergh was proud to be part of the new airmail system, although he had little confidence in the flimsy planes that would be used for mail delivery. In 1919, hotel owner Raymond Orteig offered a $25,000 prize (about $341,000 today) for the first aviator to fly non-stop from New York to Paris. Several attempts ended in injury and even death. Charles Lindbergh methodically examined data from these failed flights, and concluded the key to a successful trans-Atlantic flight was a single-engine lightweight-plane carrying only one pilot and very little else. Several investors from St. Louis agreed to finance a plane built to Lindbergh’s exact specifications. Work on his plane – the“Spirit of St. Louis”, commenced in March 1927, and was completed two months later at a final of cost of about $10,000. On May 20, 1927, Charles Lindbergh took off from Roosevelt Field in Long Island. He traveled as lightly as possible, deciding against carrying a parachute and a radio in favor of bringing along extra gasoline. On May 21, 33 1/2 hours later, Lindbergh landed the “Spirit of St. Louis” in Paris, becoming an instant international superstar. Honors and accolades were piled upon him by his own country (he won the Congressional Medal of Honor and the first-ever Distinguished Flying Cross), and many others for his ground-breaking achievement. In 1929, he married Anne Morrow, the well-known author. Constantly pursued by the press, Charles taught his bride to fly, and they both did much to promote the popularization of aviation, as well as charted routes for commercial air travel that are still used today. Unfortunately, the fame that plagued them brought untold tragedy to their family when their oldest child, 20-month-old Charles Lindbergh Jr., was kidnapped from their Hopewell, New Jersey home in 1932. The baby’s body was found in a wooded area not far from their residence 10 weeks later. The case was the biggest news story of the day, which caused added pain to a couple already dealing with unimaginable grief. After a German carpenter, Bruno Hauptmann, was convicted of killing their son, the Lindberghs moved to Europe in search of peace and safety. When Charles Lindbergh and his family returned to America in 1939, he made no secret that he was against the U.S. voluntarily entering into World War II. In 1941, he became a member of the America First Committee, a group that officially backed this policy. After the Japanese attack on Pearl Harbor, Lindbergh worked as a civilian adviser for the Army and Navy, and also flew 50 combat missions. After the war, he withdrew from the public eye as much as he could. He worked as a consultant for the Chief of Staff of the Air Force and had a small hand in the design of the Boeing 747, but he also settled down to reflect on past triumphs. For instance, he wrote “The Spirit of St. Louis”, a detailed account of his historic 1927 flight, which won a Pulitzer Prize in 1954. In the 1960s, Lindbergh became an outspoken advocate for the conservation movement. He was especially moved by the plight of the blue and humpback whales, two species on the verge of extinction. He also opposed the development of supersonic transport planes due the noise and air pollution they created. It is always wonderful to see Psalm 139 quoted. It is such an important psalm for our own time, because it shows the humanity of every person, from the moment of conception, reminding us that no one is permitted kill an innocent human being (not even one in his/her mother’s womb). God created every human soul and “knew” each of us even before we were conceived. “For thou didst form my inward parts; thou didst knit me together in my mother’s womb. I praise thee, for thou art fearful and wonderful. Wonderful are thy works! when I was being made in secret, intricately wrought in the depths of the earth.